Our Barrier Foil Pouches prevent moisture getting into your package. As a result, they preserve packaging’s performance. Consequently, they increase your products’ shelf life. While protecting moisture sensitive products, removal of water within the pack (desiccation) is only half the story. The other half is the barrier. Certainly, this is what drastically reduces the amount of moisture getting into the package. We are a major supplier of B-Sure™ barrier foil laminates to the Confectionery, Baking, Snack Food, and Drinks sectors. 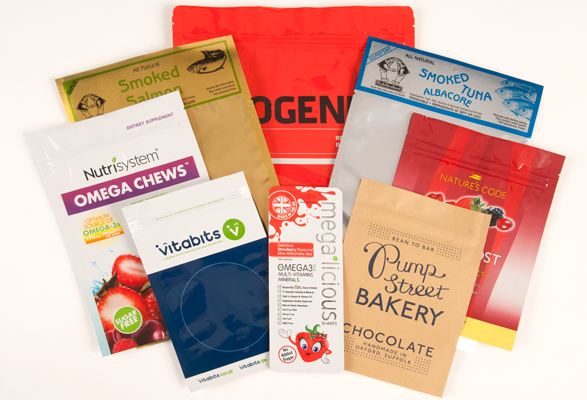 Therefore, we offer every format of pre-made pouch: Zip-Lock, Tear-Notch, Stand-Up, Lay-Flat …you name it, and we can do it ! We also supply large foil bulk-storage bags, and even pre-printed roll-stock (for fully-automated high-speed production lines). Once packed, your products will be protected against moisture damage, oxidation and UV degradation. In addition to this, our Barrier Foil Pouches will prevent the ingress of odours, and preserve the organoleptic properties of your product. Therefore, your product will be in safe hands with Baltimore Innovations! For a list of all our pouch formats please download our information sheet. For a summary of all our pouch sizes and their product codes please view portfolio. We work with a number of the world’s leading food companies – so come and work with us ! Experience …our B-Sure™ Barrier foils team has over 60 years’ experience. Safety …because our B-Sure™ Barrier foils comply with legislation for food contact. Flexibility …we can make every type of foil packaging possible and also print with over 10 separate colours. For help with your pouches requirements or any other problems that you have, please give us a call on +44 (0)1628 531900.